Wendy has been teaching Puppy Kindergarten and Novice obedience group classes for Dog Services Unlimited since 2002. Besides the group classes, she also does Private In-home lessons in cities throughout South Orange County. 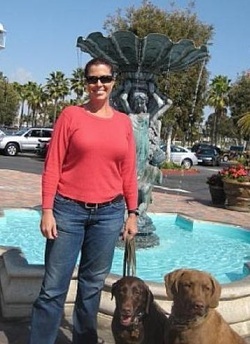 Several years ago she discovered the fun of "Dock-Dogs" with her two Labs when she attended "Wags for Wishes". Wendy also stays busy with her dog-walking service, and she loves to go camping whenever she has a break from her classes.